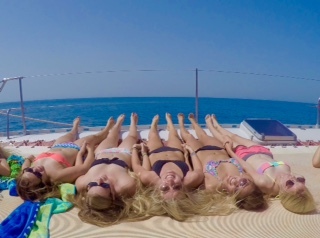 Morgan Moulton, a senior at Auburn University, describes a perfect day with Greece Direct. Who wouldn’t want to join in the fun? Today was simply wonderful. If I could travel by catamaran for the rest of my life believe me I would! The amazing Greece sunshine and constant breeze helped a little too. The catamaran sailed us through the Aegean Sea to several stops. Stop one was the hot springs. The water at the spring goes from freezing cold to bath water within a few meters! Stop two was the red sand beach complete with its infamous red sand, of course! Stop three was the white sand beach. This was my favorite stop of the trip because we got to jump out and snorkel! I could finally open my eyes in the extremely salty water. We swam through caves and climbed on huge rocks! It was such an amazing experience. We also ate a lunch of yummy barbecue chicken, Greek salad, taziki, and more traditional Greek foods while on board. Then we got to relax on the trampoline style nets on the front of the boat and take in the amazing views! So if you ever get the chance to travel by catamaran, do it! You might just have a new favorite mode of transportation.